With jet fuel going for $5.83 per gallon for full service at Sacramento Executive Airport and $5.75 per gallon for full service at Mather Airport, the $4.99 price tag for the product at Davis Flight Support serves as the initial draw for pilots looking to fill up their corporate jets and chill out near Napa or Sacramento. A 15 to 20 percent price difference is valuable in any setting, but considering that a Gulf Stream IV aircraft will pick up 2,000 to 3,000 gallons of fuel during a stop, the savings adds up quickly. Pelfrey can price his fuel lower because he was able to secure a long-term fixed-price contract before costs spiked a few years ago. The result has meant huge growth for his company and hefty support from the county government. Yolo County collects 4 cents for every gallon of jet fuel sold at its airport as part of a multi-decade agreement, and those dollars — roughly $10,000 a year — go back to the growth and development of the airport. Plus, if corporate jets are housed at the airport, aircraft owners pay taxes for that as well. Last year, Davis Flight Support received $2.7 million of a $5.59 million recovery zone facility bond to build a second 20,000-square-foot jet hangar and add additional parking. Getting more hangar space soon is crucial. Davis Flight Support and Yolo County Airport are both lacking the space to increase business. Groom is doing all he can to secure funding for the airport and has been working to resurface its runway. He has already spent $2 million in federal grants toward that purpose and is looking to secure another $3 million. “With some improvements, we think we can be more competitive,” he says. But if it’s fuel and a runway that gets pilots in the door at Davis Flight Support, it’s the amenities that keep them coming back. When a private jet lands at an airport and delivers its clients to their business or social functions, pilots are often left waiting hours for the journey’s next leg. It can be a boring and uncomfortable time akin to lounging at a truck stop. But Pelfrey and his business partner, primary investor Thomas Grant, had a niche service in mind. Out went the dated carpet and vending machines in a Yolo County Airport building, and in came the interior designers. A lounge and work center offers floor-to-ceiling views of the jet hangar, leather recliners, a flat-screen television, computers, a pool table and complementary gourmet food and drink. 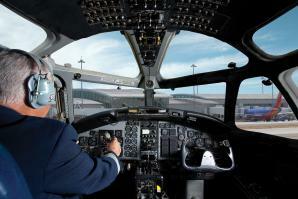 Weary pilots can shower in custom-designed bathrooms fit for a high-end hotel. There is even a private bedroom outfitted with a flat-screen television and a queen-sized bed. The cost: free. The company generates its revenue from fuel sales and aircraft maintenance, so guests can enjoy the amenities without opening their wallets. The 6,000-foot runway means Davis Flight Support can accommodate aircraft as large as a Gulf Stream IV or Global Express and can compete with private airports in the Bay. Thomas, a pilot himself, had purchased a half-dozen planes from Woodland Aviation over the years. He determined that its jet sales and service center would round out the offerings at Davis Flight Support, so in 2007 he purchased the company for an undisclosed amount, and earlier this year relocated its business to the Yolo County Airport alongside its sister company. When the consolidation has been finalized and things settle down at the airport, Grant and Pelfrey say the vision is to continue to expand, seeking out the best opportunities, cleaning them up and putting them on the market when the economy turns. The partners are continuing to market and develop the current business as well as looking to buy and sell other aircraft dealerships and service stations. “I am seeing more corporate aircraft in the air, and there is more business going on,” Pelfrey says, noting that he has been seeing more private aircrafts looking to relocate from the Bay Area and San Jose because of cost. The duo is hoping to pick up those potential clients — hence the incoming second hangar. “If I had the space, they would be moving in here today,” Groom says. 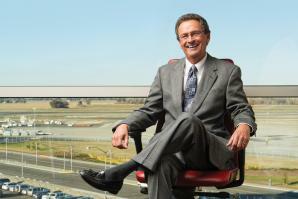 John Wheat, 63, was named director of airports for the Sacramento County Airport System in April, 2013. In September 2008, when Lehman Brothers collapsed and the municipal bond market froze, Sacramento International Airport had just begun constructing the biggest capital improvement project in the county’s history.